Solar modules are normally mounted on top of a roof as part of a roof-mounted solar power system, or a holding rack of some sort, within a frame structure. A solar module is the smallest building block of the power generating part of a solar array. Solar cells are connected together by electrical contacts that are very thin (at least in the front) so as not to block sunlight to the cell. Metals such as palladium/silver, nickel, or copper are vacuum-evaporated through a photoresist, silkscreened, or merely deposited on the exposed portion of cells that have been partially covered with wax. All three methods involve a system in which the part of the cell on which a contact is not desired is protected, while the rest of the cell is exposed to the metal. Because pure silicon is shiny, it can reflect up to 35 percent of sunlight that falls on it. To reduce the amount of sunlight lost, an anti-reflective coating is put on the silicon wafer. The most commonly used coatings are titanium dioxide and silicon oxide, though others are used. The material used for coating is either heated until its molecules boil off and travel to the silicon and condense, or the material undergoes sputtering. In this process, a high voltage knocks molecules off the material and deposits them onto the silicon at the opposite electrode. Yet another method is to allow the silicon itself to react with oxygen- or nitrogen-containing gases to form silicon dioxide or silicon nitride. Commercial solar cell manufacturers use silicon nitride. 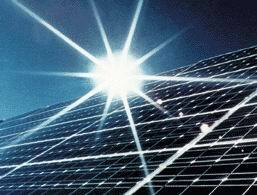 The finished solar cells are encapsulated; that is, sealed into silicon rubber or ethylene vinyl acetate. The encapsulated solar cells are then placed into an aluminum frame that has a mylar or tedlar backsheet and a glass or plastic cover. The solar module produces direct current that is used immediately by a motor. As sunlight rises and falls, current and voltage rise and fall, and the motor speeds up and slows down proportionally. The motor operates slowly during cloudy or stormy weather and does not operate at night. Applications: Remote water pumping, a ceiling or attic fan or a solar thermal (hot water) circulation pump. A small current flows from the solar module through a starting battery to counteract any inherent self-discharge in the battery. A trickle charge flows only during daylight hours, but on average offsets any self-discharge. Applications: Trickle charging of vehicle starting batteries (fleet vehicles, seasonal road equipment like snowplows) and boat batteries. A solar array produces DC current that passes through the charge controller into storage batteries. The charge regulator reduces or stops charging current to prevent battery overcharge. Small DC loads may be connected to the charge regulator, which can then prevent battery over-discharge. The battery operates loads at night and during overcast or stormy days. Solar modules recharge the batteries when average or good weather returns. Applications: Remote industrial areas (telecommunications, navigational aids, cathodic protection and traffic systems) and remote home systems. The inverter draws power from the battery and changes DC to AC current and voltage. For safety, power is sent to the distribution center which houses circuit breakers for individual AC circuits. The inverter operates from battery energy day or night. Applications: Remote home systems. The system controller monitors the battery voltage. When the voltage drops to a safe but low level, the generator is turned on. AC output is converted to DC power and recharges the battery. AC output can also be used directly to power AC loads. When the battery reaches an almost full recharge level, the generator is turned off. The solar array can be sized to supply average GE needs throughout the year, and the generator is used to fill in during seasonal low output periods and prolonged bad weather. Applications: Village power systems. 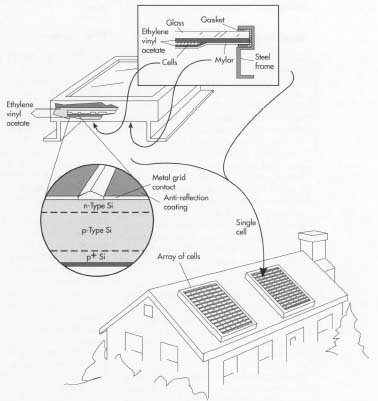 The solar array produces DC current that passes through inverter, which converts to AC current and voltage. Power is sent to the utility meter and is either consumed immediately by home or business loads, or is sent out to the general utility grid network. The utility meter spins backwards, or two meters are used to record incoming and outgoing power. At night, loads operate from utility power since the solar power system does not produce power. The inverter shuts down automatically in case of utility power failure for safety, and reconnects automatically when utility power resumes. Applications: Urban residential and commercial systems and utility-scale power plants. Peak watt (Wp): the maximum power of a module under laboratory conditions of relatively high light level, favorable air mass, and low cell temperature. These conditions are not typical in the real world. Normal operating cell temperature (NOCT): a module's nominal operating cell temperature after the module first equilibrates with a specified ambient temperature. It results in a lower watt value than the peak-watt rating, but it is probably more realistic. AMPM standard: the performance of a solar module under more realistic operating conditions. It considers the whole day rather than "peak" sunshine hours, based on the description of a standard solar global-average day (or a practical global average) in terms of light levels, ambient temperature, and air mass.